Made by Braun in Frankfurt, Brandenburg, Germany, Europe, 1958. Pocket transistor radio in white plastic casing with tuning dial on lower face and perforated chassis above for speaker behind. There is also a product information sheet and a green coloured material case to hold the radio reciever. 'Braun' manufacturers logo on back of radio. 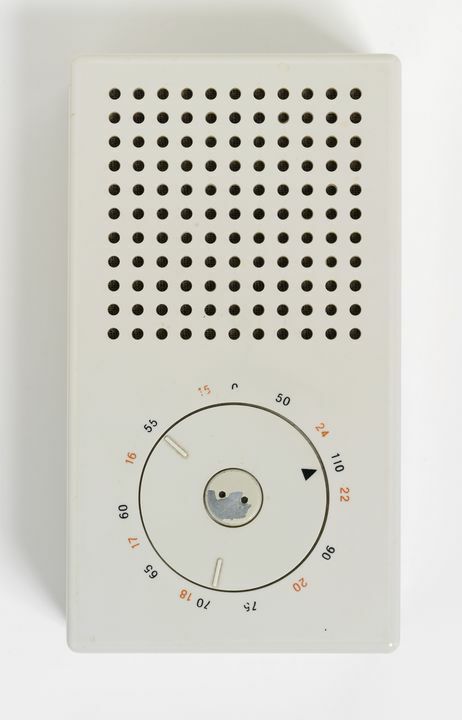 Designed by Dieter Rams and Ulm School of Design (Hochschule für Gestaltung) and manufactured by Braun AG, Frankfurt, Germany in 1958.